The Black Loyalists were the approximately 3,000 African American supporters of the British during the American Revolution who were repatriated to British Canada at the end of the conflict. Most settled in Nova Scotia and established what would be for decades, the largest concentration of black residents in Canada and what was at the time the largest settlement of free blacks outside Africa. The Black Loyalists who fought for Great Britain believed they were fighting not only for their own freedom, but for the ultimate abolition of slavery in North America. The British commitment to the these loyalists began when Virginia’s Royal Governor, Lord Dunmore, issued a proclamation promising freedom to all Virginia slaves who supported the British and the white Loyalist allies. Over the seven years of the American Revolution these men made an immense contribution to the British war effort. The black pioneers were the most famous of the Black Loyalist military units. A pioneer was a soldier whose main task was to provide engineering duties in camp and combat. Divided into a number of different corps attached to larger armies, they served as scouts, raiders, and what we would call today military engineers. While generally not a fighting unit, they would have often been called to work under heavy fire and the most dangerous conditions. As the British began preparations for their withdrawal from the American colonies at the end of the Revolutionary War in 1783, they sought land on which to settle the white and Black Loyalists who were displaced by the war. Their search led them to the largely unoccupied, unsettled province of Nova Scotia in Canada. The first Black Loyalists—men, their wives and children–arrived in Halifax and other Maritime ports in the summer of 1783. Since they had fought for the British Crown and were promised the same rights, privileges and freedom that their white counterparts were to receive, they expected land and to be incorporated into the provincial political structure. They were, however, betrayed by the colonial government which initially provided neither land or respected their political or civil rights. Some British Army officers suggested the Black Loyalists be used as ransom for the British prisoners still held by the Americans. Civilian Loyalists, including many slaveholders from the thirteen colonies, argued that the blacks should be re-enslaved. During this period of vulnerability, the black migrants became the source of cheap labour for the more prosperous Nova Scotians, often scrambling to survive by any means available to them. Black Loyalists, however, pressured the colonial government of Nova Scotia to honour its commitment to them. Many held certificates signed by British General Samuel Birch, guaranteeing their freedom, and a promise that a small plot of land would be waiting for them. In September 1783, the colonial government finally provided land. Seven companies of black pioneers were led by their black commander, Colonel Stephen Blucke to the new settlement, which they named Birchtown in honour of General Samuel Birch. These settlers became known as the Birchtown Black Loyalists. Birchtown soon became the destination of choice for many isolated communities of blacks and refugees. 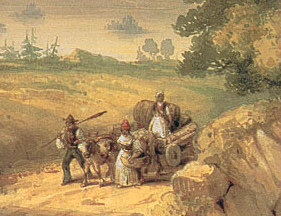 The population ranged from 1,500 to 2,000 people, more than half of the Black Loyalists in Nova Scotia. Birchtown, however, soon proved unsuitable. The community was situated on the rocky side of the Halifax harbour, and was virtually surrounded by a large swamp. The available farmland was mostly rocky barren soil. The Black Loyalists were left to work this area for nearly a decade with virtually no livestock, guns or ammunition for hunting, lumber for housing or capital or credit for supplies. Ultimately these liabilities took its toll on the settlers. In 1791, Thomas Peters, a Pioneer sergeant, journeyed to London to lodge a formal complaint about the injustices black settlers were suffering in Nova Scotia. While in London, Peters met with the chairman of the Sierra Leone Company and was able to negotiate the free passage of approximately 1,200 black Nova Scotian residents to the west coast of Africa, where they would help establish a free black colony. Consequentially, Birchtown was mostly depopulated by 1792 as nearly all of the people who had a choice left for Africa. Colonel Stephen Blucke and about 50 families remained but most of them gradually moved away over the years to Halifax and other cities. Today most of Birchtown’s residents are white. Nonetheless it is the home of the Black Loyalist Society. There is a National Heritage Monument on the site of the original Birchtown cemetery and a small museum in a 19th Century school. Joseph Mensah, Black Canadians: History, Experiences, Social Conditions (Halifax: Fernwood Publishing, 2002); James W. Walker, A History of Blacks in Canada (Ottawa: Minister of State and Multiculturalism 1980); John Demont, Reclaiming a Hard Past, Maclean’s 113:7 p.26 (02/14/2000).